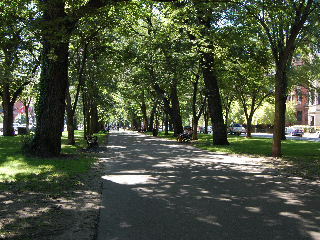 The third link in Boston’s Emerald Necklace park system is the Commonwealth Avenue Mall. Proceeding from the Boston Common, through the Boston Public Garden, and crossing the street, one enters the expansive median of Commonwealth Avenue. The layout of this grassy mall is sometimes compared to, and is said to be based on, the boulevards of Paris. The park was designed in the mid 1800’s by Arthur Delevan Gilman, although the overall and inclusive design of the Emerald Necklace park system is attributed to Frederick Law Olmsted. On either side of the street, beautiful old brownstone residences line the corridor. 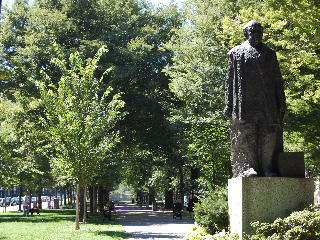 The Commonwealth Avenue Mall is located in the prestigious and historic area of Boston known as the Back Bay. The park is a haven for walkers, joggers, strollers, dog-walkers, picnickers, or those intent on just relaxing on the grassy expanses or on the many benches adjoining the paved pathway through the center of the mall. Statues depicting historical figures from Boston’s past are placed periodically along the pathway, adding a touch of “human-made” interest to the otherwise mostly natural setting. A canopy of mature hardwood trees (among them maple, elm, ash, and others) provides shady relief from the heat of summer. When winter brings the snows to Boston, the stark outlines and shadows of the leafless trees lend contrast to the white blanket, making the whole scene look like a black and white photograph of the landscape. At Christmas time, strings of electric lights on the otherwise bare trees add a picture-postcard brightness to the holiday in the popular city park. If one continues walking on through the length of the Commonwealth Avenue Mall, the next link in the Emerald Necklace park system is the Back Bay Fens. This park, more spreading in its layout than the linear mall, was formerly a saltwater marsh area. The Fens takes its name from the surrounding Fenway neighborhood. Not far away, is the famous Fenway Park baseball stadium of the Boston Red Sox baseball team.